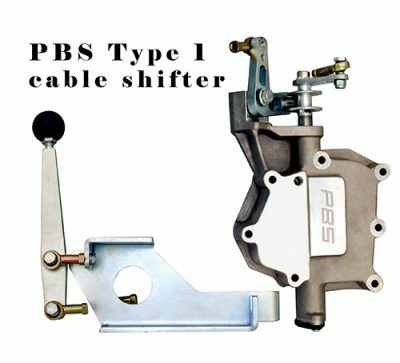 Our mid engine PBS cable shifter designed for use in Type 1 applications eliminates stress and vulnerability encountered when using the VW Nose Cone. 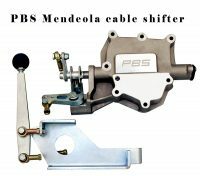 Provides the same positive feel of the OEM shifter. Made of 356 T6 cast aluminum the unit integrates a spring loaded reverse lockout built into the cover. Complete with everything except the cables, which you can custom order to fit your application. 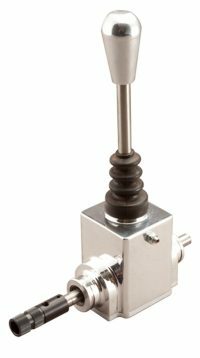 Can be installed with ordinary hand tools without dismantling your transmission! Slight modification to the shift rail is necessary. 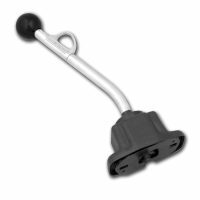 An optional VW mounting adapter is available and bolts onto the rear plate of the shifter cover. Two holes on the bottom pick up the stock VW nose cone mounting tab on the frame. Adapter plate is 3/8″ steel and the two holes are tapped for mounting. Mounting hardware for the plate is included with the adapter.